I’m writing this on the plane as I fly back home after a crazy (but awesome) long weekend in Chicago at the annual Food and Nutrition Conference and Expo (FNCE). I spent the past four days with 10,000 other dietitians in the windy city getting up to speed on the latest nutrition research, networking, visiting with friends, and tasting way too many new food products. The conference is always a blast and well worth it. Each year the expo features 100s of food brands, offering samples, coupons, giveaways, and more. Listed below are a few of my favorites. Check them out and let me know what you think! Not only do I love these nut butters but I love the company's mission. 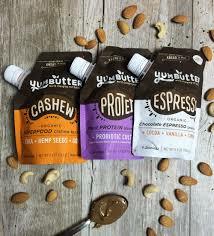 For each jar or pouch of yumbutter you purchase, they feed a hungry child in Guatemala. They have a variety of flavors and many are mixed with chia and hemp seeds for added nutrition (like omega-3s). Not only is their peanut butter amazing, but this is the first PB powder I’ve seen without added sugars that actually tastes good. A lot of pb powder companies brand the product as low-fat. Low-fat does not necessarily equate to healthfulness. To me, the healthy fats are one of the huge benefits of peanut butter in the first place. I like PB powders not because they're low in fat, but because they're easy to add a little peanut butter taste to smoothies, banana ice cream, or even peanut sauces and stir-fries. Plus, they're great for camping or backcountry adventures, without the extra weight to carry. While some swear they need coffee to wake up in the morning, coffee usually makes me feel completely off. It usually upsets my stomach, gives me a headache, or makes me shake. For me, La Colombe is different. A few mornings this past weekend, I was feeling especially tired after late nights networking and early morning education sessions, so I thought I’d give it a try. I tried both the seasonal peppermint and the mocha and LOVED both! These draft lattes are super smooth and gave me the perfect amount of energy without making me shake or feel sick. 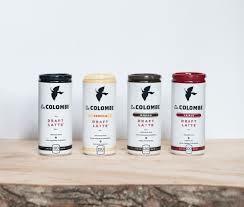 Unfortunately, La Colombe is not in Montana yet, but I was happy to hear I can order them on Amazon. You have to try the Lemon Berry Chia! It's flavored with lemon oil, and is absolutely amazing. I typically recommend looking for granolas and bars with less than 8 grams of sugar per serving, and Kitchfix products have just 6 grams. The granolas are all lightly sweetened with apple juice or maple syrup and have the perfect amount of sweetness without tons of added sugar. They also happen to be grain-free. Bolthouse farms is my favorite brand of salad dressings because of their ‘cleaner’ ingredients, amazing taste, and variety of options. I love their 1915 Organic Juices too and am just overall a big fan. I was excited to meet them at FNCE and try their new products. They were showcasing their new line of plant-based milks (now in stores!) which were very good. The milks are dairy free and are made with pea protein. Most milk alternatives (almond, soy, cashew milk, hemp milk, etc.) don't quite compare to cow's milk when it comes to protein, calcium, and vitamin D. But the Bolthouse farms products are the best I've seen yet! They have 10 grams of protein per serving (cow's milk has 8), and are also high in calcium and vitamin D. I would recommend the unsweetened or original versions, as the chocolate and vanilla are high in added sugars. Keep an eye out in the refrigerated section of your grocery store, these will be coming soon! Yesterday, I posted a picture to my InstaStory of a handout I got from the Regular Girl booth. It showed the different types of poops and what each type means - dehydration, constipation, diarrhea, or normal. I was surprised by how many people saw this and commented back with questions! For constipation we may need to be drinking more water or incorporate more fiber into our diets. For diarrhea, we may need more soluble fiber to help bulk up our stool - oatmeal, beans, nuts, apples, blueberries. Regular girl offers a prebiotic and probiotic fiber supplement you can easily add to a meal to boost the fiber content and keep you regular. We need about 25-30 grams of fiber each day and the majority of Americans do not meet these needs. I added some of the Regular Girl supplement powder to my smoothie this morning and could not even taste it. So many supplement powders alter the taste or texture of the meal, so I loved that I could not tell it was there. Stay tuned- I just registered with them to be able to offer you coupons and samples! Let me know if you're interested and I'll hook you up! If you're trying to simplify meal prep you should also check out my Meal Prep Made Easy Workbook. It's loaded with recipes, tips, worksheets, meal plan charts, and more. I'd heard of Daily Harvest through social media in the past, but had been a bit skeptical to try. I was happy to connect with them at FNCE and try a few of their flavors. Daily Harvest offers a smoothie subscription, delivery service. They send you containers of frozen smoothie ingredients and all you have to do is add liquid and blend. They're a great way to simplify meal prep and keep healthy go-tos on hand. I was super impressed with each one I tried. They tasted great and are healthy too! I was really impressed with this product and it's good for you ingredients. I loved the seasonal pumpkin creamer because it's made with real pumpkin puree and spices - no artificial ingredients or taste. You can actually see the spice granules so you know it's the good stuff. Perfect for those with allergies - it also happens to be soy-free and dairy-free. Simple Mills has quite the impressive line up of products. I've tried a few in the past, but their frosting was new to me. Each time a friend has a birthday, I struggle with what to use for frosting. It's hard to find a quality frosting without hydrogenated oils or mystery ingredients and I don't always have time to make it from scratch. But Simple Mills has done it! They have a chocolate and vanilla frosting made without hydrogenated oils (trans fats) and only 7 grams of sugar per serving and it seriously tastes amazing! Flaxseeds have been trendy lately – but did you know our bodies can’t actually break down the outer shell to reap the benefits of the Omega-3s and other nutrients? In order to absorb the anti-inflammatory Omega-3s, the flax seeds must be ground into a meal before eating. This company makes a ground flax that is amazingly soft and tasty. I’ve tried other brands but nothing compares to the soft texture of this brand.